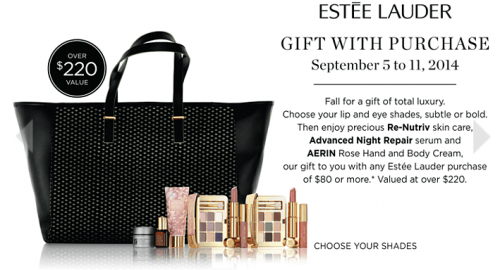 Holt Renfrew Canada Offers: FREE Estee Lauder Gift Valued at $220 With Your $80 Purchase! Shop at Holt Renfrew Canada online for a limited time to enjoy their brand new FREE Gift With purchase promotional offer! Shop for your favourite Estee Lauder products from Holt Renfrew from today, Friday, September 5th through to September 11th, 2014 and you can receive a FREE Estee Lauder gift when you spend $80 or more on Estee Lauder Products. The FREE Estee Lauder gift set is valued at over $220 which make this totally worth it! This is a gift of total luxury. You can select your shades for lip and eyes – between subtle and bold. It also comes with the Re-Nutriv Skin Care, Advanced Night Repair Serum and Aerin Rose Hand and Body Cream. Limited to one gift per customer, while supplies last. Wow I was taking a look through their inventory so I could suggest what to spend $80 on to get this fantastic offer, I never realized that some of their dresses can cost up to $2000. I don’t think I even realized that someone would even spend that on clothing. Excuse me while I pick my jaw up off of the floor. Even some of their scarves cost $550! Click here to check out this Holt Renfrew Canada Promotional Offer! You can’t buy Clinique or any other products. This is a promotion by Estee Lauder in conjunction with Holt Renfrew. You have to purchase $80 worth of cosmetics or skin care products or perfume, etc that are Estee Lauder products to receive the Lauder gift.